The Barber is a B-movie’s B-movie. While many of the tropes those well-acquainted with this type of film have come to know are present, several of them are approached uniquely or service the plot in ways far less tired than the tropes themselves. Truer to form still is the ridiculously overdone ending, another familiar element of these types of convoluted thrillers. With that having been said, this movie is not any kind of intentional satire. Rather, The Barber only stands out when compared to its peers, among which it still certainly belongs. The film begins with a woman trapped in a wooden box, screaming for mercy as she is buried alive. Next, of course, it cuts to a news montage detailing the Chicago police’s investigation of the murders of seventeen women, their arrest of a prime suspect, and his subsequent release due to the possibility of evidence tampering by an overly zealous member of their team. Haunted by his mistakes and still convinced his department let the right guy go free, the investigator kills himself, leaving his young son, John, behind. Twenty years later, John (Chris Coy, “Deliver Us from Evil”) believes he has found the unjustly released man, a quiet barber in Moraine who goes by the pseudonym Eugene Van Wingerdt (Scott Glenn, “The Bourne Legacy”). Eugene lives a quiet life cutting hair, mentoring at risk youth in his community, and maintaining casual friendships with local law enforcement, motel keepers, and other notable members of his town. No one would ever suspect that the kindly older man could be a killer, which is why they’re so surprised and intrigued when John appears and attacks him outside of a diner. Detained by the chief of police (prolific character actor Stephen Tobolowsky), John claims that Eugene is his long lost father. Once he is let go, John confronts Eugene about who he believes the man to be a second time. While Eugene maintains his innocence and desire to protect his new identity, John is not convinced, and interprets Eugene’s telling him to go away as a test. He tells Eugene that he is an aspiring murderer too, and hopes that if he can prove that he has killed someone, and therefore has just as much to lose as the man he has come to Moraine to find, Eugene will open up to him about the tricks of his trade. Meanwhile, back in Chicago, Audrey (Kristen Hager, “Wanted”), John’s ostensible girlfriend, is working as a detective for the same department as John and his father. When she stumbles upon the obsessive board of pictures, newspaper clippings, and the address and phone number of exactly where he’s gone that most such characters have in their apartments, she goes in search of John, despite the warnings of their captain (Tim De Zarn, “The Cabin in the Woods”) that she’ll be off his payroll as well if she does. While Scott Glenn’s portrayal of Eugene is effectively understated and nuanced, the same cannot be said of Chris Coy’s relentlessly one note John. Glenn’s suspected serial killer clearly has something to hide, whether it’s the fact that he was framed or the fact that he is guilty, and much of the beginning of the film has one wondering whether he really is going to teach John how to get away with murder or if he has something more treacherous up his sleeve. Coy, on the other hand, gives us a John who plays the stereotypical bad cop role in such a way that his true motivations (is he actually trying to frame Eugene? How far is he willing to go? What if he really does want to become a murderer too?) are extremely difficult to discern. His unrealistic bouts of violence — namely, stabbing Eugene the first time he meets him and attacking a former employee of Eugene’s at a car wash with a bat — do not work with either his character, the fact that he’s supposed to be a police officer, or the rest of the script, making him a difficult protagonist to root for. What The Barber does right is certain slight modifications of the aforementioned tropes. When one character blatantly offers herself up as a victim, she is openly called on it in addition to being preyed upon. Rather than being in a secret closet or stash or notebooks, the protagonist’s collection of research is tacked to the underside of a table. 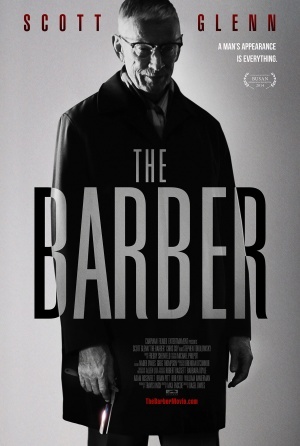 Still, the flurry of twists in the final moments of the film combined with a long winded cliche monologue from the villain leave The Barber unable to be seen as truly inventive, despite all the things it does do right. Can ssomeone pleaseexplain what the very last scene is supposed to mean? Does he kill his girlfriend?